Whether you’re embarking on a full bathroom remodel or just replacing a small fixture, it’s worth it to hire the right plumbing contractor. At VP Plumbing in Ames, our master plumber and team have over 20 years of experience when it comes to residential plumbing. We’ve installed, replaced, and repaired all types of bathroom fixtures, from clawfoot tubs to standing showers. Don’t leave your bathroom remodel to chance — work with the Top Rated Local® plumbing company in Ames for reliable, expert service. Contact VP Plumbing today! 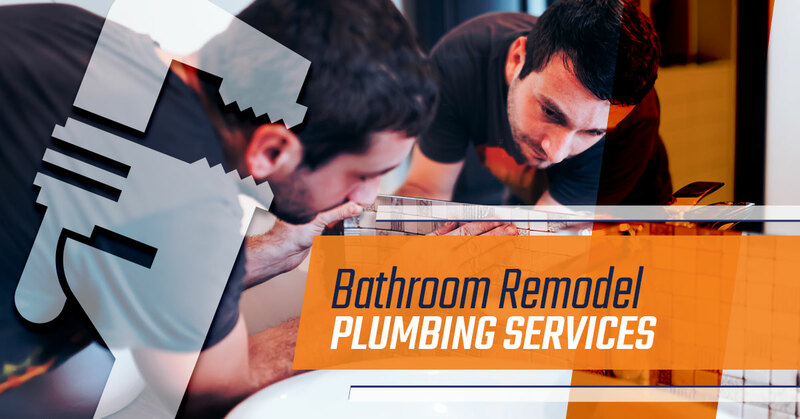 If you have a specific question about your bathroom remodel project or want to learn more about our plumbing services, just give our team a call today in Ames. Hiring the right local plumbing for the job might be easy, but choosing the bathroom fixtures for your renovated space can be quite difficult. With sinks, what’s most important is to make sure you have enough space in front of the sink and cabinet. The rule of thumb is to have at least 30 inches in front of the sink and cabinet. Drop-in: the sink is dropped into the vanity or countertop; there must be enough space to support the sink. Under-mount: sinks are installed beneath the surface, so the bowl starts below the countertop or vanity. Vessel: these sinks look like bowls that sit atop a porcelain base. Wall-mount: a great option for smaller sinks, these sinks hang from the wall and require in-wall plumbing. One-piece: a sink is supported by a base, so it stands on its own as one piece. One-piece showers: the drain pan, wall, glass door, plumbing and fixtures are all included with this type of shower. It’s self-contained and generally easy to install. Glass doors: a nice touch for old and new showers alike, glass doors add ambiance to your bathroom. Synthetic showers: made from vinyl, plastic, PVC, or other similar materials, these showers are easy to install and also come as one unit. Tile: the possibilities are endless with tiled showers, as you can choose the size, color, shape, and pattern of the shower. Glass block: a better option for privacy than transparent glass, a glass block will distort an image but still let in natural light. You might not need to replace your entire bathroom if it’s in decent shape. Instead, you can change up the appearance by updating fixtures, refinishing the tub, or changing up the tile around it. Replacing your toilet is one of the best ways to encourage better energy efficiency in your home. In fact, all modern regulations require toilets to use 1.6 gallons of water or less per one flush. If you have a pre-1990s toilet, you could be wasting valuable water and energy. If you have questions about installing a certain fixture, feel free to give us a call today at VP Plumbing in Ames! 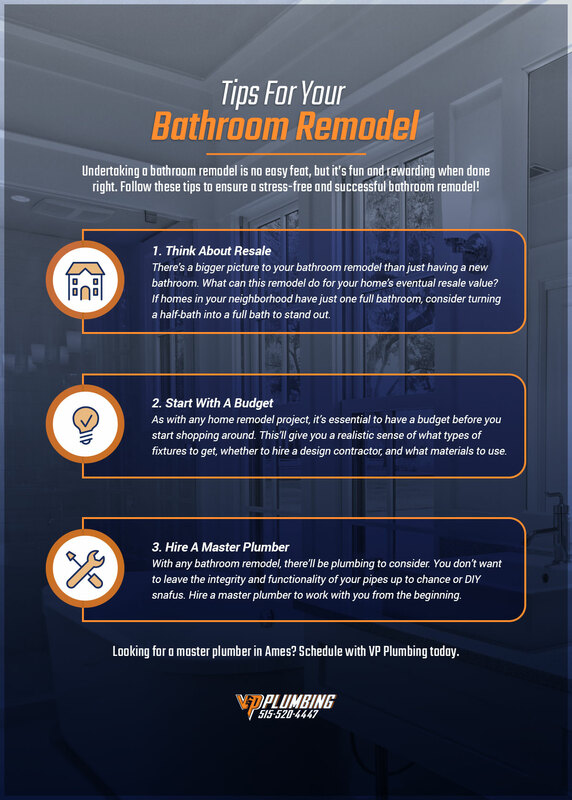 In the age of HGTV and DIY projects, it can seem like a bathroom remodel is a reasonable undertaking. While it might be fun to tile on your own and knock down a wall or two, plumbing is a slippery slope for DIY projects — literally. Because bathroom plumbing is so intricate, it’s generally safer to work with a licensed plumber as opposed to completing the project yourself. The last thing you want is for a burst pipe to flood your home, leaving you with costly repairs and and a still-unfinished bathroom. As we mentioned, bathroom plumbing is extremely detailed. Even if it seems intricate enough to replace a fixture, it’s usually a bit more complicated. It’s not just a matter of mixing up hot and cold water pipes — although that happens, too. It’s an issue of messing up one pipe enough that it affects the integrity of your entire residential plumbing system. When you remodel your bathroom, it’s imperative to keep the big picture in mind. Especially when it comes to plumbing, smaller fixtures (like a great faucet you found) must fit into the existing plumbing blueprint. The more fixtures, the more plumbing you need. As such, it’s much easier to work with a local plumber who understands the connection between individual aspects and your home’s plumbing infrastructure. If you’re totally overhauling an old bathroom, there are certain factors you want to be aware of. Even if you have a rudimentary knowledge of plumbing, it can sometimes take a master plumber to spot years-old water damage, leaks, and inefficient pipes. Hiring a plumber for a bathroom remodel ensures not only that you’re installing new fixtures effectively, but also that you’re repairing old damage. Design — if you’re using a contractor, this is where they come into play. If you’re doing it yourself, make sure to follow standard bathroom design protocol to avoid some surprises along the way. You’ll lay out where you want your tub, sink, shower, etc. — keeping plumbing in mind. Demolition — assuming you’re overhauling your old bathroom, the remodel will involve tearing out fixtures. You can have a hauling company send the old fixtures to the dump, or you could consider donating them to a store like Habitat For Humanity ReStore to minimize waste. Roughing-In — in this stage, your plumbing contractor will install new plumbing, fix old plumbing, and generally complete their foundational work. Electricians will do the same thing at this stage. At this point, you should local officials should inspect your bathroom to ensure it’s up to code. Installation — now that the plumbing groundwork is set, your plumbing company will install the fixtures (bathtub, shower, toilet, etc.). Final Touches — with all the fixtures in their proper places and functioning, you’ll put the final touches on your bathroom. You can lay the floor, tile around the sink, paint the walls, install light fixtures, or anything else you want to make the room feel complete. For your bathroom remodel, work with our Top Rated Local® master plumber in Ames. Call VP Plumbing today to schedule services! We have 20 years of experience when it comes to bathroom remodel, and we have the “master plumber” certification to prove it.